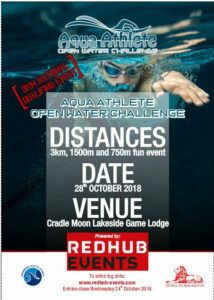 Aqua Athlete’s Open Water Challenge, powered by RedHub events, will be held at Cradle Moon Lakeside Lodge on 28th October 2018. This is an SSA-sanctioned event and is an Open Water Champs qualifying event – distances offered are 3km, 1500m and a 750m fun event. All events will be electronically timed by Spectrum Sport.